Vivekanantha Homeo Clinic & Psychological Counseling Centre, Chennai: Suffering with Alopecia Hair falling, is there is any best treatment in Homeopathy medicines for alopecial hair falling? Suffering with Alopecia Hair falling, is there is any best treatment in Homeopathy medicines for alopecial hair falling? Doctor Answer: Dear madam, No worries, Homeopathy treatment helps for you, please find the complete details about the Hair falling below. Proper treatment helps you, you need to consult the doctor in person to rule out that you are suffering with Scalp psoriasis or not. Hair fall or Baldness typically refers to excessive hair loss from your scalp and can be the result of heredity, certain medications or an underlying medical condition. Anyone — men, women and children — can experience hair loss. In male- and female-pattern baldness, the time of growth shortens, and the hairs are not as thick or sturdy. With each growth cycle, the hairs become rooted more superficially and more easily fall out. Heredity likely plays a key role. A history of androgenetic alopecia on either side of your family increases your risk of balding. Heredity also affects the age at which you begin to lose hair and the developmental speed, pattern and extent of your baldness. Female-pattern baldness-FPB- (androgenetic alopecia). Women with permanent hair loss usually have hair loss limited to thinning at the front, sides or crown. Women usually maintain their frontal hairline and rarely experience complete baldness. This type of permanent hair loss occurs when inflammation damages and scars the hair follicle. This prevents new hair from growing. This condition can be seen in several skin conditions, including lupus erythematosus or lichen planus. It's not known what triggers or causes this inflammation. Symptoms: This rare condition occurs when inflammation damages and scars the hair follicle, causing permanent hair loss. Sometimes the patchy hair loss is associated with slight itching or pain. This is classified as an autoimmune disease, but the cause is unknown. People who develop alopecia areata are generally in good health. A few people may have other autoimmune disorders including thyroid disease. Some scientists believe that some people are genetically predisposed to develop alopecia areata and that a trigger, such as a virus or something else in the environment, sets off the condition. A family history of alopecia areata makes you more likely to develop it. With alopecia areata, your hair generally grows back, but you may lose and regrow your hair a number of times. Symptoms: Hair loss usually occurs in small, round, smooth patches about the size of a quarter. Usually the disease doesn't extend beyond a few bare patches on the scalp, but it can cause patchy hair loss on any area that has hair, including eyebrows, eyelashes and beard. In rare cases, it can progress to cause hair loss over the entire body. If the hair loss includes your entire scalp, the condition is called alopecia totalis. If it involves your whole body, it's called alopecia universalis. Soreness and itching may precede the hair loss. This type of hair loss is usually due to a change in your normal hair cycle. It may occur when some type of shock to your system — emotional or physical — causes hair roots to be pushed prematurely into the resting state. The affected growing hairs from these hair roots fall out. In a month or two, the hair follicles become active again and new hair starts to grow. Telogen effluvium may follow emotional distress, such as a death in the family, or after a physiological stress, such as a high fever, sudden or excessive weight loss, nutritional deficiencies, surgery, or metabolic disturbances. Hair typically grows back once the condition that caused it corrects itself, but it usually take months. Symptoms: This type of temporary hair loss occurs suddenly. Handfuls of hair may come out when combing or washing your hair or may fall out after gentle tugging. This type of hair loss usually causes overall hair thinning and not bald patches. Excessive hairstyling or hairstyles that pull your hair too tightly cause traction alopecia. If the pulling is stopped before there's scarring of your scalp and permanent damage to the root, hair usually grows back normally. Symptoms: Bald patches can occur if you regularly wear certain hairstyles, such as pigtails, braids or cornrows, or if you use tight rollers. Hair loss typically occurs between the rows or at the part where hair is pulled tightly. Hormonal changes. 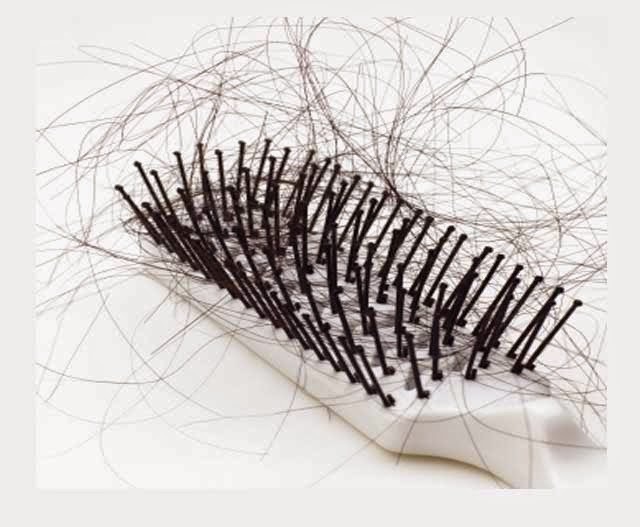 Hormonal changes and imbalances can cause temporary hair loss. This could be due to pregnancy, having a baby, discontinuing birth control pills, beginning menopause, or an overactive or under active thyroid gland. The hair loss may be delayed by three months following a hormonal change, and it'll take another three months for new hair to grow back. During pregnancy, it's normal to have thicker, more luxuriant hair. It's also common to lose more hair than normal about three months after delivery. If a hormonal imbalance is associated with an overproduction of testosterone, there may be a thinning of hair over the crown of the scalp. Correcting hormonal imbalances may stop hair loss. Hair treatments. Chemicals used for dying, tinting, bleaching, straightening or permanent waves can cause hair to become damaged and break off if they are overused or used incorrectly. Over styling and excessive brushing also can cause hair to fall out if the hair shaft becomes damaged. Symptomatic Homoeopathic medicines works well for all types of Hair Falling. Without anyside effect.